Give Greenleaf Lawn Care a call at 918-640-6405 to find out why you should allow us to be the ones that take care of your lawn. Our Tulsa we control company was founded by two great friends named Jamie Nix Josh Mathias. These two men grew up together in Tulsa, Oklahoma and have been working in the industry since 1998. Because of their hard work they have become the choice of great companies like Mathis Brothers, Outback Steakhouse and many other companies that are looking for the best Tulsa weed control around. You can join them by giving us a call today. Jamie is actually a graduate of the University of Tulsa. He has an amazing passion for assisting people in Tulsa to help them make their lawns beautiful. He is currently engaged to a lovely lady will also is very passionate about the Tulsa area as well. Jamie spends much of his time studying and learning how to improve his skills and craft of bringing the best quality and service to every home we visit in Tulsa. Josh is the president of turf enhancement. This means that he is focused on making sure that our customers receive the best lawn care possible every single time that we go to their home. Josh is currently married and is blessed with one beautiful child and has one bun in the oven. A great fact about Josh is that he is known throughout all of Tulsa and even the surrounding areas as being the fastest weed Wacker in the South. With all the skill and knowledge he possesses in turf enhancement engineering he is definitely one of the reasons why Greenleaf has succeeded like it has. Both of these men are also very passionate about the area and the school system. This is why they have come up with a way to give back to local schools. We are offering a way for our customers to also give back. Every time a new client purchases a service a portion of that money will go to a local area school. We are giving you, the customer the ability to choose which school system that money goes into. This program is called “cut for the kids” and is very popular among our clients. If you want to help out the children in our area public schools give us a call and join our family today. We know you will be glad that you did. Greenleaf doesn’t just offer Tulsa weed control we also offer many other services that you will find useful. Some of the services that we offer are our amazing six step fertilization process, we can lawn maintenance, flower bed maintenance, hedge trimming and shaping, be for removal, sod installation, small shrub removal and planting, small tree removal and planting, spring cleanup and lawn scalping and so many more services as well. We want you to be fully taken care of when we come to work with you and you can always expect to get the best service and product available. 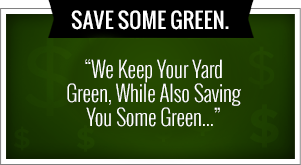 Give us a call and we will talk to you and let you know what we can to beautify your lawn with our Tulsa weed control. Tulsa weed control guru’s Greenleaf Lawn Care can help you with your Tulsa weed control but we are also able to help you with one of the most hated jobs by all mankind. That job is putting up your Christmas lights. There have been many, many strong men that have been brought to tears over the years from Christmas lights. Do you honestly know anybody who enjoys the process of putting up their own Christmas lights? I know there are people enjoy the end result, but truly does anybody really enjoy the process? If you are one of the 98% that do not enjoy putting up their own Christmas lights, give us a call at 918-640-6405. I think men despise putting up Christmas lights because there are so many variables that can go wrong during the process. The first, and one of the most difficult parts is trying to have one of your days off of work coincide with a day that has nice weather. The majority of time you take off the day of work to put up lights it will either be a day with 50 mile per hour winds, hundred degree heat, below zero temperatures or even torrential rain. The odds of finding the perfect day are stacked against you write the beginning. Then comes the process of trying to find the bins that you thought you marked of Christmas lights. After moving boxes and boxes trying to find the lights that you have not touched in a year you realize that you use that been to prop up one of the sides of your workbench. So you bring in the men and pop it open only to reveal the complete all of lights tied in a knot that not even a trained Boy Scout could unravel. Even if you get the strand of lights all straightened out the moment the truth comes when you plug it in and one third of the strand lights up. You then face the decision of whether or not to try and fix the lights by putting a single bulb in each of the 200 sockets or to drive to the store and get new ones. One thing you need to be aware of is that your wife will not understand why you can’t just “make them work” like they did last year. By her asking this question it will force you to stand at least in our and a half trying to find which bulb is burnt out and making the strand not work. On a side note when Christmas light boxes say that they will stay lit even when a bulb is burned out, they are lying. After going to the store and buying multiple new sets of lights you then proceed to get on a ladder and face which ever weather condition it was that you decided to deal with. You spend the next four hours trying to get those goofy little clips to stay on your gutters and hold the lights as well. After you get all of your lights up you go down to plug it in realizing that you put the plug-in on the wrong side and will have to run a 40 foot extension cord around the house to plug it in. This is just a brief reason why this is the most hated thing by all mankind. But not to worry we at Greenleaf are here to take care of all of this for you so you don’t have to worry at all. 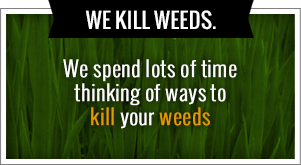 We can also take care of your Tulsa weed control as well.